When people hear “Passive House” they commonly associate it with a Passive Solar home. There is a similarity between the two: They both take advantage of solar gains during the heating season. The differences are in the building envelope. A passive house does not rely on thermal mass to slowly release stored heat (although it could). It relies on quality triple-pane windows and a super-insulated, air-tight building envelope to keep the heat from escaping. We want the free heat from the sun, but we need to be careful about how we utilize this resource. There’s a delicate balance between collecting heat in the winter and overheating in the summer. Shading is also critical in this equation, and I’ll go into greater detail on that topic in another post. We started with a detailed look at the property. It is a city lot, with partial Southern exposure. I say partial because it’s a corner lot and the lot boundaries adjacent to the streets run Southwest and Northwest. There is also an existing house next door (to the Southeast). The lot survey will tell you all you need to know – the property line trajectories are marked down to the nearest degree. The Southwest lot line is 42 degrees from South and the lot is not large enough to rotate the home for optimal exposure. Now it’s a question of moving the house as far forward as possible to lessen the shading effects from the neighboring house, and playing with window placements and sizes to optimize gains, losses, daylight and of course – curb appeal. Design… where do you start? 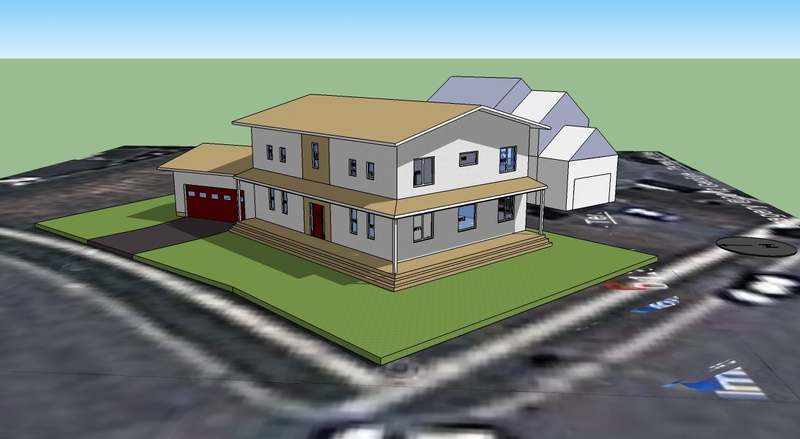 While the design of any home is a challenging exercise, it takes on new meaning in a PH (Passive House). Meeting the world’s most demanding energy standard for buildings is no small feat – the buildings must be designed from the footing up with PH in mind. There is also the temptation to make it look like a PH… OK, there’s something wrong with that statement. A PH does not have to look any different from a code-built home. It is a remarkable home though, and it’s tough to ignore that while in the design stage; Should it look different because it is a high-performance home? The software tool used to model energy usage (PHPP) takes everything into account (more on that in another post). The PH standard is based on energy use per square meter of floor area, so it makes sense that a building shape that is simple (corners are notorious for creating thermal bridges in construction) and a footprint with a favourable A/V (area to volume) ratio makes the standard easier to reach. As you can imagine, a long, stretched-out bungalow will have more outside wall area per square meter of floor space than a 2-storey building in the shape of a cube. The problem of course, is that it’s tough to make a cube look interesting without making it really stand out … The neighborhood is well established, and while it does not present a particular theme or home style, the houses are what you might consider to be normal/standard given their age.